Online display advertising is estimated to be a $200 billion industry. Google Adwords is one of the leading avenues of display advertising. Google AdWords allows you to target online users by utilizing keywords,it displays ads when those specific keywords are typed in by a user. Ad placement is determined by the Cost-Per-Click(CPC) bid that is placed for each individual keyword along with several other factors as well. Ads can be targeted to people searching in a specific city or region and ads can be customized to show specific information like your phone number or address. When someone clicks on your ad they are linked to your website where they are able to learn more about your businesses products and services. This is a great compliment to your existing site to aid in lead generation and promote your online presence. Online display advertising is one of the most effective ways to advertise today. We can set up an advertising budget that meets your needs and then we will manage your campaign for you. No fuss or frustration for you. We'll take care of all the details. Competition is fierce in the online world today and here at IDO we feel that we should offer our clients every possibility to capitalize on the internet's vast array of marketing opportunities. 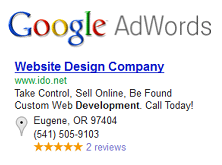 IDO offers online display advertising management services to work in conjunction with your website. Questions about online display advertising? Give us a call at 541-505-9103.